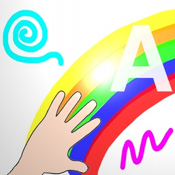 "Finger Painting Animator" is the "ANIMATOR" version of the software "Finger Painting". This application was designed to create 2D animations and movies. Once you have drawn the keyframes of the animation (drawing and editing using the fingers of your hands, using features such as edit / add / remove / copy / move / rotate / modify objects attributes, etc…), the software automatically creates all the intermediate frames (inbetweens) interpolating and animating (tweening) the control vertices of the drawn keyframes (keyframing). Create your storyboard and the 2D animation movies with "Finger Painting Animator" and use the movies in the video editing app You prefer. - Enable/disable control for "under finger"